With all of the recent shooters that have come out, from Call of Duty: Black Ops III to Halo 5: Guardians, there has been no shortage of titles that will test your reflexes. These types of games have a tendency to bring out the most competitive aspects of players, and one of the ways that they try to gain an edge can be through a controller such as the SCUF Infinity1. To begin, the SCUF Infinity1 controller for the Xbox One is neither built for, nor priced for, the average Player. There is a very specific, competitive market in place for this type of controller, which can easily run about two hundred dollars, depending on the different options chosen for it. To begin, there are plentiful options out there on the website, allowing you to choose from different appearances - but also lots of different features. For this controller, I had some specific items in mind. I chose the FaZe Rain shell, with no additional 3.5mm headphone jack. One of the best things about the SCUF controllers is that they are built to not just resemble an actual Xbox One controller, but are the same form factor. You can modify it, but for someone who has spent a lot of hours with his hands on a standard Xbox One controller, I could appreciate the familiarity right off of the bat. Next up, I opted for the standard four paddle configuration on the back (the most unique aspect to these controllers, which I will talk about more in a few minutes), but also picked the remapping key so I could test the functionality. I also opted for the adjustable hair triggers plus trigger stop mechanism while leaving the rumblers in. Next, I chose the trigger pro plus SCUF grips and finished the controller off by using default Xbox One SCUF branded thumbsticks (with the option to change them out) and a control disc for the direction pad. Okay, so that sounds like a lot - and it is, so I will try to give a better overview of the different features and what worked for myself and the others, and what failed to resonate. First, the controller itself looks sharp. I am not someone who is usually into aesthetics as a primary hardware component, but while plunking down a good chunk of change on a controller, there is nothing wrong with liking its appearance. 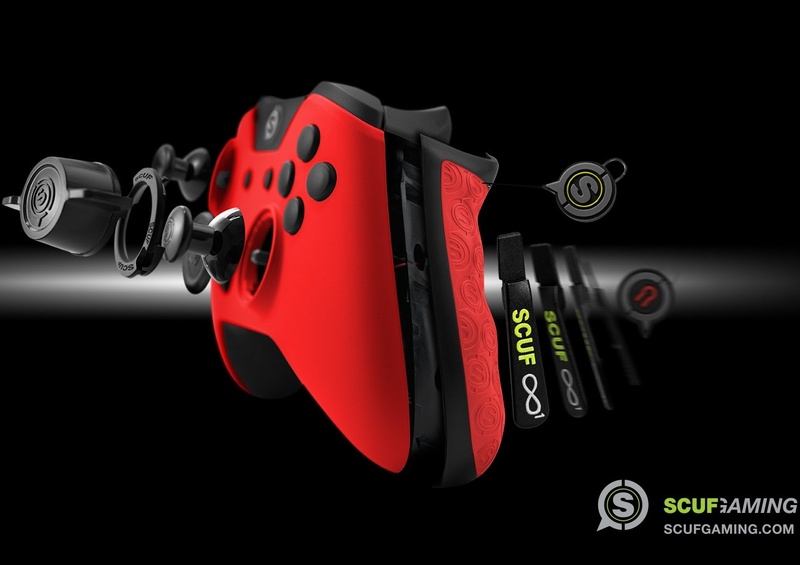 The paddles on the back are how SCUF has really made its name over the years. For those unfamiliar with these paddles, they serve as a duplicate means of input, copying each of the Xbox One face buttons. The idea behind this is simply this: if you can use your fingertips that are already resting at the back of the controller to operate your face buttons, your right thumb never has to come off of the stick you use for aiming in a shooter. It sounds simple in theory, but I questioned the execution. I was concerned that there would be frequent accidental strikes of the back paddles when I first used the controller. In fairness, that did happen a fair amount early on, though I quickly adapted to the idea. Did this make me a better player? It is hard to say. I still finished ranked about where I usually did in a match, but I certainly could appreciate not having to take my right thumb off of the stick while jumping or reloading a weapon on the fly. The paddles themselves are thin but durable. Lots and lots of clicks later, I never felt any kind of a misfire or concern that they were not working. I would not recommend crushing down on them in a fit of rage, and the two middle most paddles might be harder to reach for those with smaller hands. My son experienced this issue. He had no trouble with the two on the ends, but the internal ones were a trickier matter. Out of my two buddies, one really liked the paddles, but the other struggled to adjust to them. He has been playing Call of Duty for so many years, that he instinctively kept using his thumb on the face buttons instead of making use of the paddles. The remapping key simply lets you assign the paddles to a different button configuration and is quite easy to use. You press the magnetic key to the appropriate spot on the controller and then pull the paddle you want to assign to and then press the button on the controller you want assigned to it. Next up are the hair trigger and stop mechanisms. The Adjustable Hair Triggers allow you to tweak the tension of your triggers, until they feel just as responsive as you would like. The stop mechanism means you do not have to pull the trigger down all of the way. Normally you have to bottom those out to squeeze off a shot, but this allows you to more rapidly fire off multiple shots in quick succession. Not as helpful for people using automated weapons, but for burst or single fire, these are pretty slick options that do improve your firing rate. They came with a pry tool that allows the trigger trips to be removed or customised as needed, since this configuration would be rather poor for those looking to play a game like Forza 5. While it may appear to be a largely cosmetic thing, I actually enjoyed the rubbery grips applied to both sides of the controller. The groove-like texture helps out when you are playing for a long time and the controller is threatening to slip in your grip. Admittedly, I have that issue more with the PlayStation controllers than the Xbox ones, but the tactile feeling it provided was immediately comfortable. Last but not least were the directional pad and sticks. I opted to have the removable control disc added. I actually liked that quite a bit, because while the Xbox One's directional pad is better than it was on the 360, it has still never been my favourite. The circular pad makes it easier to make use of angles, though those looking for a straight vertical or horizontal press might find it a bit more confusing since you lose those clear lines that make up the cross shaped pad. By lifting straight up and off the pad does snap free easily, but I never had any issues with it coming off when attached either. I settled for the default SCUF sticks, which are Microsoft size and length by default. I liked the SCUF grooved trademark in the centre of the sticks, though admittedly I somewhat missed the ribbed edge found on a default Xbox One control stick. This particular model came with options to customise my stick layout, but making use of the SCUF ring system. Using a small circular tool to twist and unlock the ring, you can easily remove the stick and replace it with a different one of your choosing. It is quite nice to be able to do all of this without having to wrestle with any screws, and the process is both quick and easy. The different stock options come in three lengths (short, normal, tall) and in two different styles (concave and convex). The site recommends using a shorter concave one for walking. This makes sense since walking is usually not a precision process in shooters and you have to lean on the stick in a particular direction for long periods of time. I have always preferred a sunken concave stick myself, because it is less likely to slip after an extended time holding it in a particular direction. What was interesting, was the site recommended a taller, convex one for your right thumb. I tend to use sniper classes in Call of Duty, as does my other buddy who plays Halo. We thought that we would try this out and we both liked the result. It was responsive, our thumbs rolling the stick easily and with precision. I admit that I was wary of this method early on, but like the paddles, it grew on me rather quickly and I am currently using that mixed method on my controller now. With the SCUF Infinity1, you can pretty much craft your ideal controller. There is something to be said for the numerous possibilities that it shipped with (including some nice finishing touches, such as a quality braided USB connection cable, batteries and a protective carry case as well), though I could make a strong case for the adjustable sticks and remapping key options. These do cost some extra money, but it is probably best to decide what you want to do with your customisation options after getting your hands on one of these and feeling them out for yourself. Item Reviewed: Gadget Review: SCUF Infinity1 (Microsoft Xbox One) 9 out of 10 based on 10 ratings. 9 user reviews.